On Tuesday and Wednesday this week, the artists Valerie Harding and Beth Downey visited the Royal Gwent and Nevill Hall Hospitals, and led drop in workshops in the Beechwood café, Main Outpatients and the Dialysis Unit at St Woolos. Staff, patients and visitors joined in and decorated leaves and butterflies in glass that will be included in the artwork for the Gift of Life commemorative project. The finished artworks will be on display in the Beechwood café and the corridor leading to Main Outpatients in Nevill Hall. Valerie and Beth also worked with students from Coleg Gwent at both Nash and Ebbw Vale sites, who have been working on the project with Specialist Nurses Jo Davies and Nicky Newbound. The workshop programme continues next week with visits to Nevill Hall on Tuesday 27th and the Royal Gwent on Wednesday 28th Nov. Everyone is invited to come along and join in – no experience is necessary! For more information, contact Sarah Goodey (01633 23 4517) sarah.goodey@wales.nhs.uk. 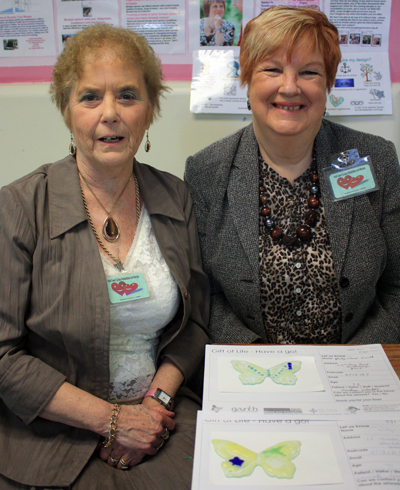 Pictured are Gladys Olwyn Smith and Delys Davies with their finished butterflies. Gladys and Olwyn are volunteers with the Gwent Cardiac Rehabilitation Aftercare Charity.